Congratulations to the Admiral Trust runners who completed the Royal Parks Half-Marathon on a wet and windy Sunday 14th of October. The team of Kevin Withers, Sarah Ritchie, Leah Withers and Max Hilliggen completed the beautiful course of four of London’s Royal Parks, Hyde, Kensington Gardens, St James’ and Green, with each producing a personal best. 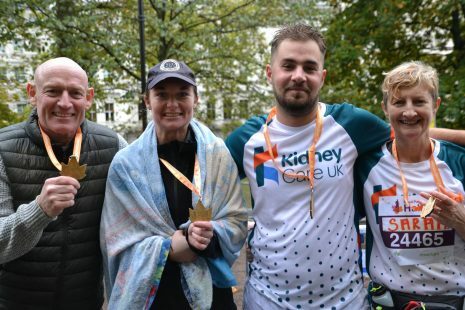 In doing so they have raised over £2,800 to date, with more donations still arriving, for Kidney Care UK, money that will do a great deal to help this great cause. To those who have sponsored this event a huge thank you from the Admiral Trust and Kidney Care UK. If you have not sponsored us so far and wish to, just donate on the www.AdmiralTrust.org.uk and mark your donation HalfMarathon. The team are staying in training and will be looking for a suitable venue for their next venture. Once again thank you runners.